Scottish country dancing (or SCD, for short) is a modern form of the country dancing popular in England and Scotland in the 18th century. It involves groups of six to ten people (most of the time) of mixed gender (most of the time) — a “set” — dancing to the driving strains of reels, jigs and strathspeys played on the fiddle, accordion, flute, piano, drums, etc. (no bagpipes, mostly!). The dance often combines solo figures for the first couple in the set with movements for all the dancers in the set. Many Scottish country dances derive from traditional sources such as old manuscripts and printed dance collections, but a lot have been devised in the fairly recent past, say the last fifty years or so. This fusion of the traditional and the modern as well as its ongoing evolution are part of the attraction of Scottish country dancing. 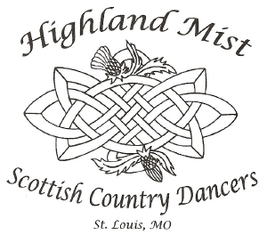 This page was created in partnership with the Highland Mist Scottish Country Dancers of St. Louis, MO. Click the above link to learn how to do Scottish Country Dancing. Below are the dances that were performed at the Highland Mist Annual Ball on June 26, 2010 with a brief description of the dance along with video. 1 - 8 All circle four hands round and back. 9 - 16 Right hands across and left hands back. 17 - 24 All turn opposite with right hands; all turn opposite with left hands. 25 - 32 All advance and retire; drop hands and pass thru opposite couple, passing right shoulder to face new couple. 01 - 08 1st man dance a right-shoulder reel on the side with 2nd and 3rd man, while 1st woman dance a right-shoulder reel on the side with 2nd and 3rd women. 17 - 24 1st and 2nd couples dance an allemande. 1st woman finishes the allemande between 2nd couple in a line of three, facing down. 1st man finishes the allemande between 3rd couple in a line of three, facing up. 25 - 28 All set twice; on bars 27-28, 1st couple turns by the left, to finish on own side in 2nd place. 29 - 32 All set twice on the side. 01 - 08 1st cpl cross by the right and cast down 1 place. 1st cpl dance right hands across with 3rd cpl. 09 - 12 1st cpl dance an alternating tandem half reel of 3 with the person in the man's 1st corner position. 13 - 16 1st cpl dance an alternating tandem half reel of 3 with the person in the woman's 1st corner position. 17 - 20 1st cpl dance an alternating tandem half reel of 3 with the person in the man's 2nd corner position. 21 - 24 1st cpl dance an alternating tandem half reel of 3 with the person in the woman's 2nd corner position. 25 - 32 1st man, followed by his partner, dance left hands across with 2nd cpl. 1st cpl retain hands and half turn to 2nd place own side. 2nd, 1st, and 3rd cpls set. The tune for this dance was published by Nathaniel Gow around 1800. The Ramseys were an old Scottish family settled in the Lothians and were one of the gentry in Edinburgh around 1800. The dance was written to honor one of the Ramsey family. 1 - 8 1st, 2nd, and 3rd cpls dance six hands round and back. 9 - 16 1st, 2nd, and 3rd cpls dance a grand chain. 17 - 24 1st cpl dance down the middle and back. 25 - 32 1st and 2nd cpls dance half rights and lefts. 2nd and 1st cpls turn one-and-a-half times with both hands, finishing on own sides of the dance. 01 - 08 1st cpl cast one place, cross by the right hand, cast below 3rd cpl, and dance up the middle to finish back-to-back in the center, ready for double triangles. 2nd cpl step up on bars 01-02. 09 - 16 Dance double triangles; 1st cpl finish facing 2nd corners. 17 - 24 1st cpl dance a reel of four with 2nd corners. 1st cpl finish the reel by passing partner left shoulder to face 1st corners. 25 - 32 1st cpl dance a reel of four with 1st corners. 1st cpl finish the reel by passing partner left shoulder. 1st cpl end in 2nd place facing out to start the next repetition. 09 - 16 1st and 2nd cpls dance a poussette. 1st finish the poussette facing out on own sides. 17 - 24 1st cpl dance reels of three across the set. 1st man dances a reel with 2nd cpl, giving right shoulder to 2nd man to begin. 1st woman dances a reel with 3rd cpl, giving right shoulder to 3rd woman to begin. 25 - 28 1st cpl turn by the right hand one-and-a-quarter times to 2nd place on opposite sides. While 2nd and 3rd cpls dance half rights and lefts. 29 - 32 3rd, 1st, and 2nd cpls chase clockwise to places. 01 - 08 1st and 2nd cpls dance a chain progression: 1st and 2nd cpls turn partners 3/4 around with right hands; end with men facing up. 1st man and 2nd woman turn one-and-a-half with the left hand to meet partners; while 2nd man and 1st woman chase halfway around the turning cpl for 4 bars. 2nd cpl in 1st place turn three-quarters to finish in 1st place own sides; while 1st cpl in 2nd place turn halfway round with right hand to pivot: pulling right shoulder back to face 1st corners. 09 - 12 1st cpl dance corner pass and turn with 1st corners, passing right shoulders to finish facing 2nd corners. 13 - 16 1st cpl dance corner pass and turn with 2nd corners, meeting in the center to pull right shoulders back to face 1st corners again. 17 - 20 1st cpl set to 1st corners on the 1st bar, pulling right shoulder back to face partner up and down the dance. Then 1st cpl turn halfway with the right hand to finish facing 2nd corners. 21 - 24 1st cpl set to 2nd corners on the 1st bar, pulling right shoulder back to face partner up and down the dance. Then 1st cpl turn halfway with the right hand to finish facing down with nearer hands joined. 1st man does a polite turn. 25 - 32 1st cpl dance down between 3rd cpl and cast up, meeting in center with nearer hands joined. Dance up between 2nd cpl, and cast off to 2nd place on own side. Meanwhile, 2nd and 3rd cpls dance rights and lefts, starting up and down on the sides. 01 - 08 1st and 2nd cpls dance right hands across and left hands back. 09 - 16 1st and 2nd cpls turn by the right and then turn by the left. 17 - 24 1st cpl lead down the middle and up to 2nd place. 2nd cpl step up on bars 19-20. 25 - 32 2nd and 1st cpls circle four hands round and back. You're the belle of the ball, At St. Bernard's Waltz. 01 - 08 1st woman and 2nd man set twice, then turn with right hand. 09 - 16 1st man and 2nd woman set twice, then turn with left hand. 17 - 24 1st man, followed by his partner, casts behind 2nd man, crosses up between 2nd cpl, casts behind 2nd woman, and crosses to 2nd place own side. 1st woman finishes in 2nd woman's place. 2nd cpl step up on bars 23-24. 25 - 32 2nd and 1st cpls dance right hands across and left hands back. This dance is a favorite with Highland Mist due to the music, which is lively and has a nautical flavor. 01 - 08 1st cpl cross down by right hand to finish back-to-back facing the opposite side of the set; giving hands to each corner and set. 1st cpl cast round 1st corner to form lines of three across the set: 1st man between 3rd cpl, and 1st woman between 2nd cpl. All six dancers set. 09 - 16 1st cpl, turning to the right, dance right shoulder reels across the set. 1st cpl end passing left shoulder to 2nd place on own sides. 17 - 24 1st cpl lead down for 2 bars, lead up for 2 bars, cross at the top of the set, and cast into 2nd place on own sides. 2nd cpl step up on bars 21-22. 25 - 32 2nd and 1st cpls dance rights and lefts. 01 - 08 1st cpl cast down behind own lines, and cast back up to places. 09 - 12 1st woman, crossing in front of her partner, turns 2nd man one-and-a-half times by the right hand, while 1st man turns 2nd woman one-and-a-half times by the right hand. These turns take place on the sides of the set. 2nd cpl finishes in 1st place on own side; 1st cpl finishes in 2nd place on opposite side. 13 - 16 1st man turn 3rd woman left hand, while 2nd woman turns 3rd man by the left hand. 1st cpl finishes facing 1st corners. 17 - 28 1st cpl dance hello-goodbye setting. 29 - 32 1st cpl dance a reel of three on the sides, giving right shoulder to 2nd corner to begin. On bars 31-32, they cross to own side, giving right hand. 01 - 08 1st cpl set and cast. (2nd cpl step up on bars 03-04.) 1st cpl cross right hands to face 1st corners on the side. 1st cpl change places right shoulder with 1st corners. 09 - 16 Reels of three on the side. 1st cpl begins the reel by giving right shoulder to 1st corner. 17 - 24 Reels of three across the dance. 1st man begins reel by giving left shoulder to 2nd man; 1st woman begins reel by giving left shoulder to 3rd woman. Corners dance back to their original corner position, while 1st cpl loop into 2nd place on opposite side to face 1st corners. 25 - 32 1st cpl turn 1st corner right hand; pass partner right shoulder; turn 2nd corners right hand; pass partner right shoulder. 1st cpl finishes in 2nd place on own side. This dance is in strathspey tempo, a type of music found only in Scotland. A strathspey is danced with stateliness. Actually, dancing slowly is more demanding that dancing to a fast jig. 01 - 04 1st cpl turn with right hand once round and cast off one place. 2nd cpl step up on bars 03-04. 05 - 08 1st cpl turn by the left hand once round. 1st woman casts up and 1st man casts down to finish three and three across the dance. 09 - 12 1st, 2nd, and 3rd cpls set twice. 13 - 16 1st woman casts down while 1st man casts up. They turn each other right hand, and finish three and three on own side of the dance. 17 - 20 1st, 2nd, and 3rd cpls set twice. 21 - 24 All three cpls turn partners with both hands once round. 25 -32 2nd and 1st cpls dance rights and lefts. 01 - 08 1st cpl dance a figure of eight around 2nd cpl, crossing down to begin; while 3rd cpl dance a figure of eight around 4th cpl, crossing down to begin. Meanwhile, 2nd and 4th cpl set to partners and cross over giving right hands; set to partners again and cross over giving right hands. 09 - 12 3rd cpl, followed by 1st cpl, dance down the middle for 2 bars, and set to partners. 13 - 16 1st cpl, followed by 3rd cpl, dance up the middle for 2 bars. 1st cpl cast off to 3rd place, while 3rd cpl dance up to 1st place. 25 - 32 3rd cpl with 2nd cpl, and 1st cpl with 4th cpl, dance a poussette. Finish in the order 2, 3, 4, 1.